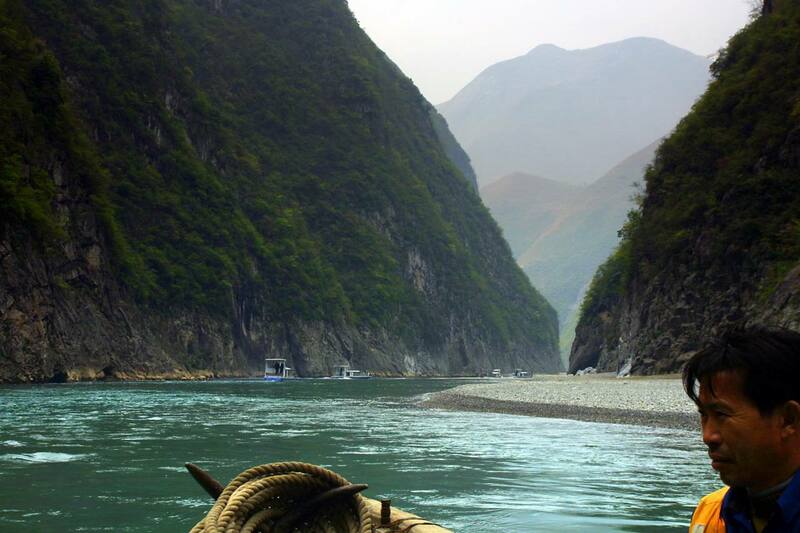 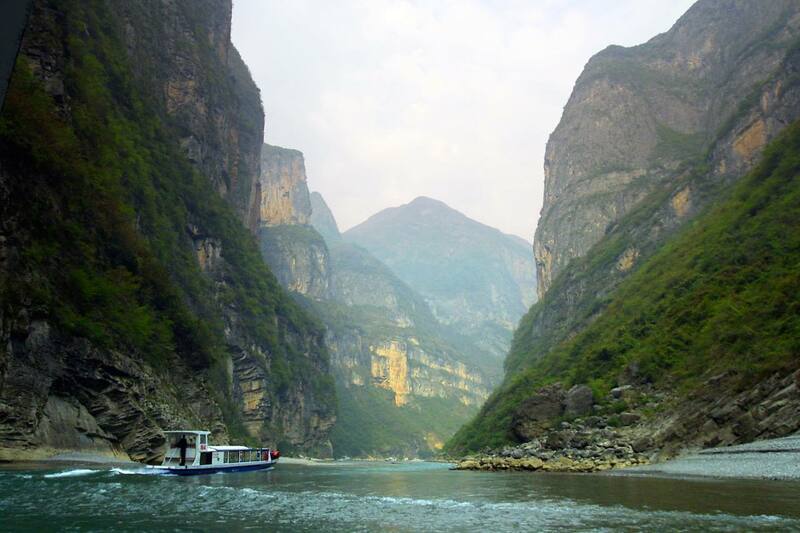 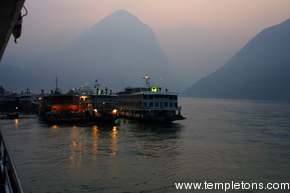 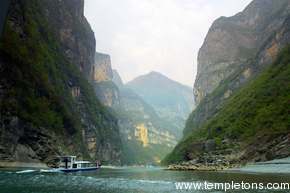 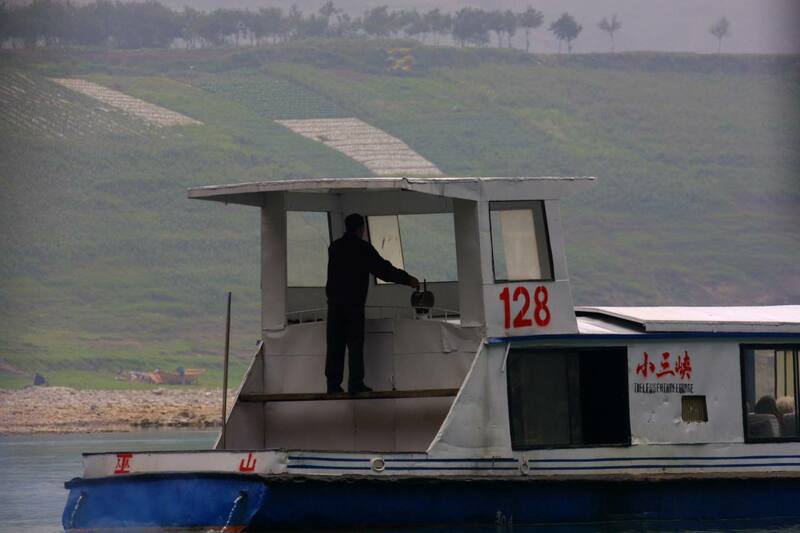 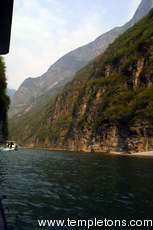 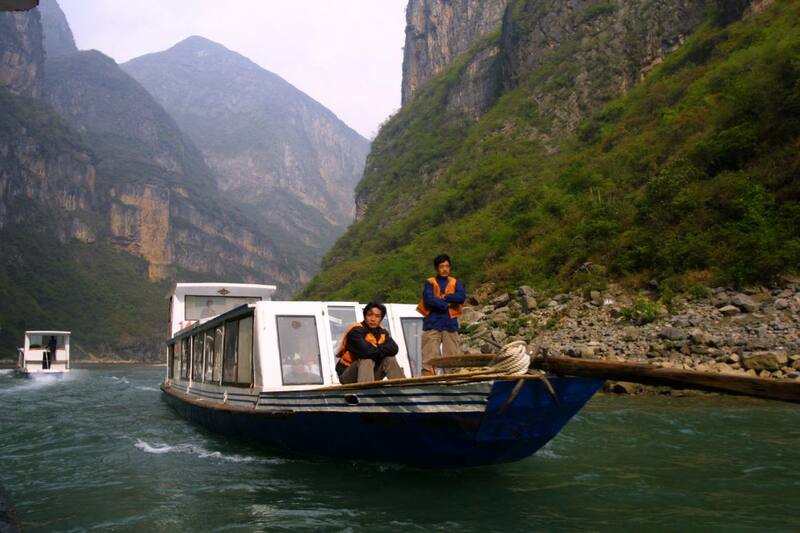 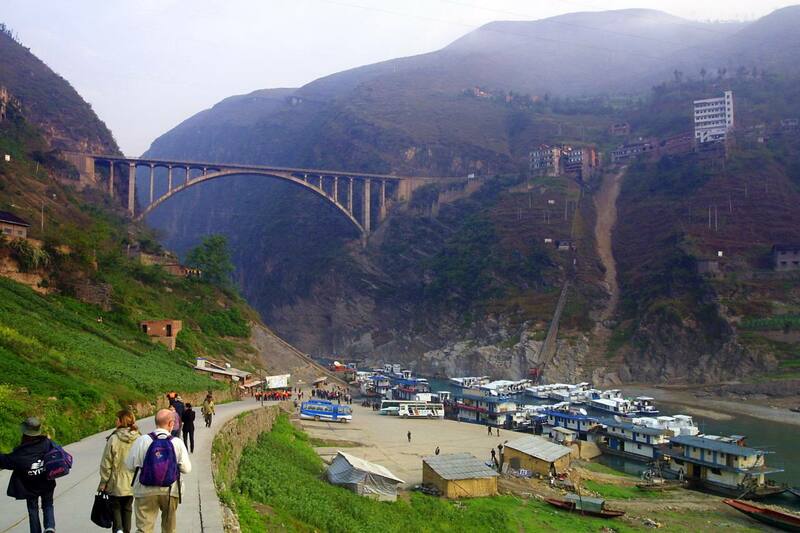 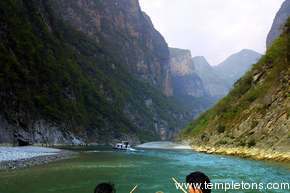 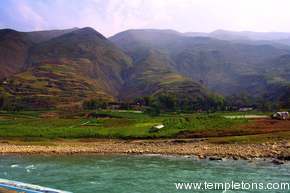 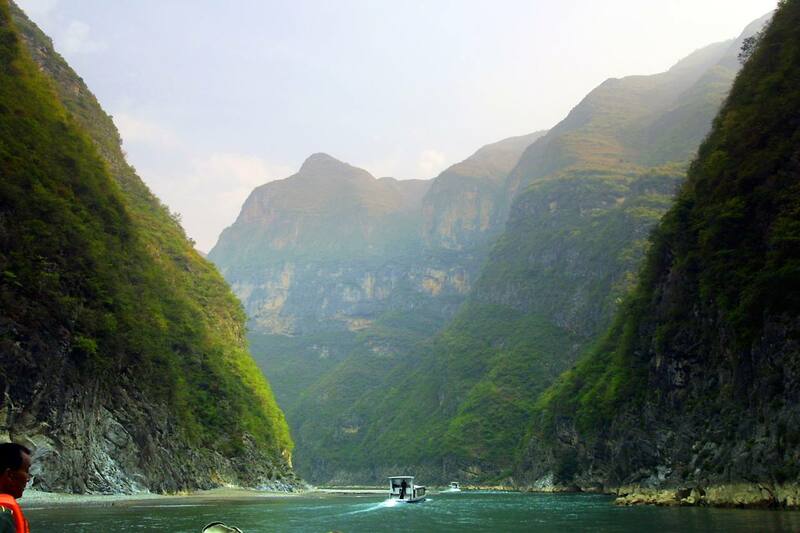 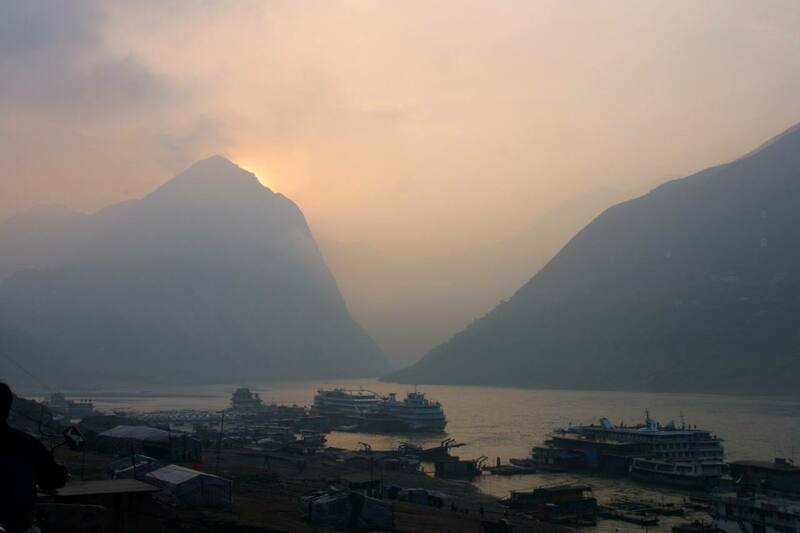 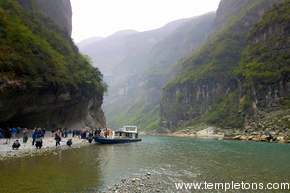 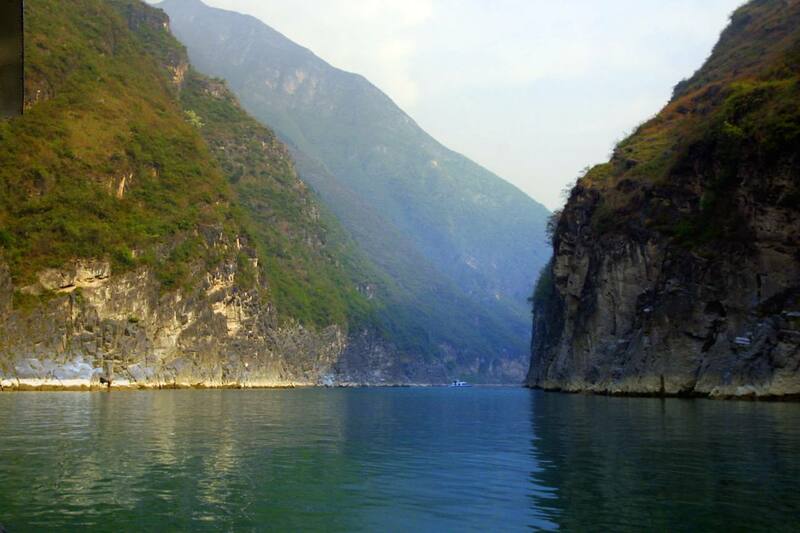 Several tributary streams off the Yangtse have gorges of their own that will also be flooded. 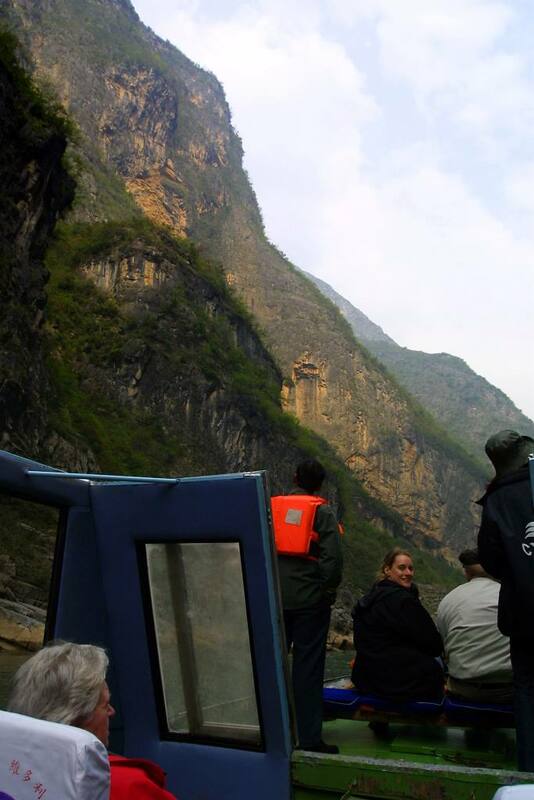 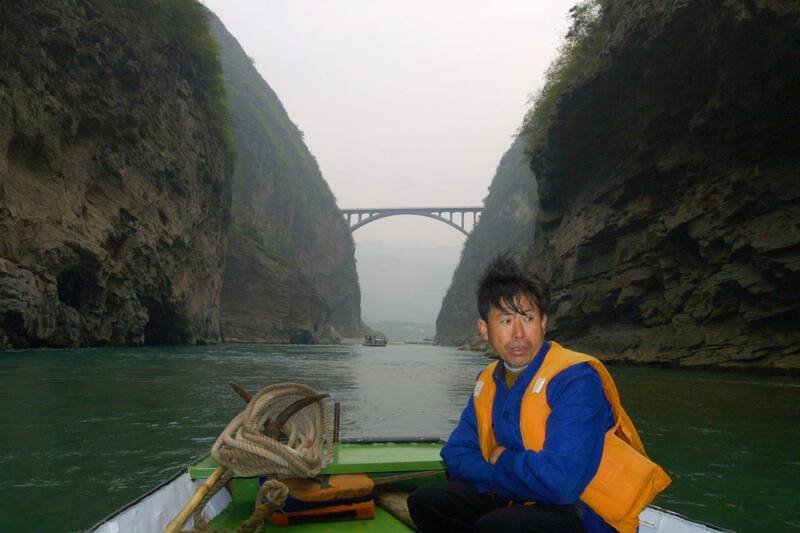 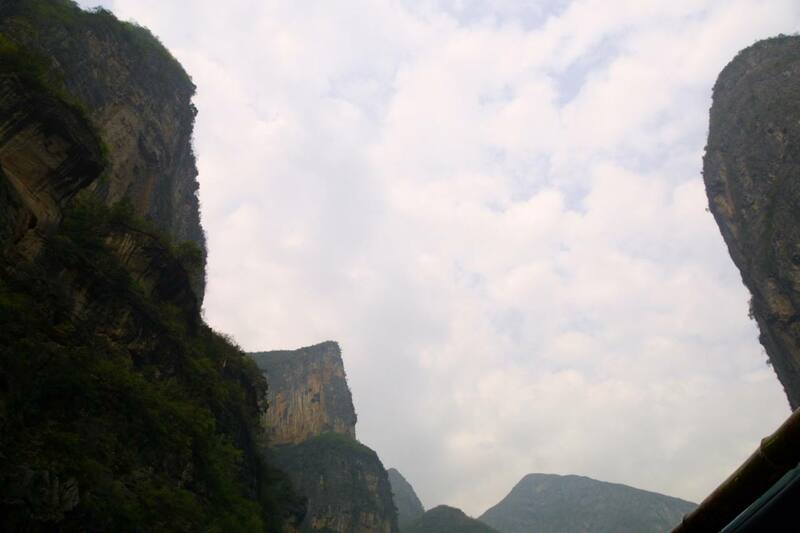 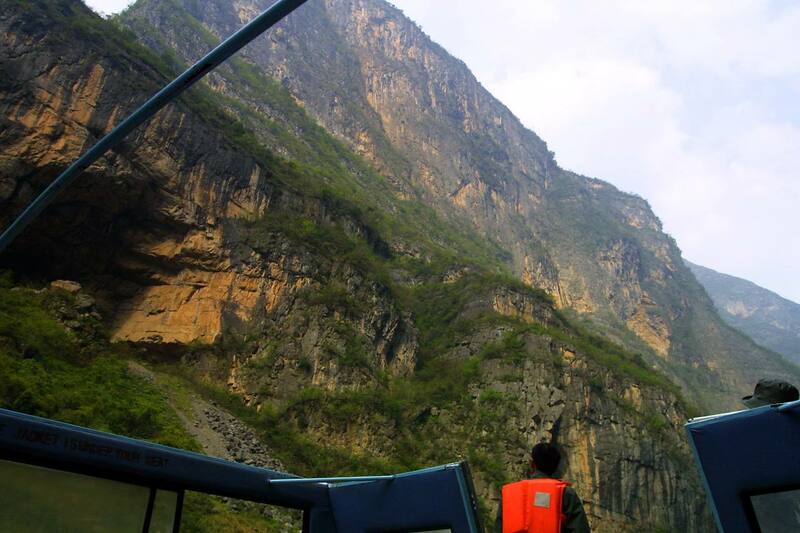 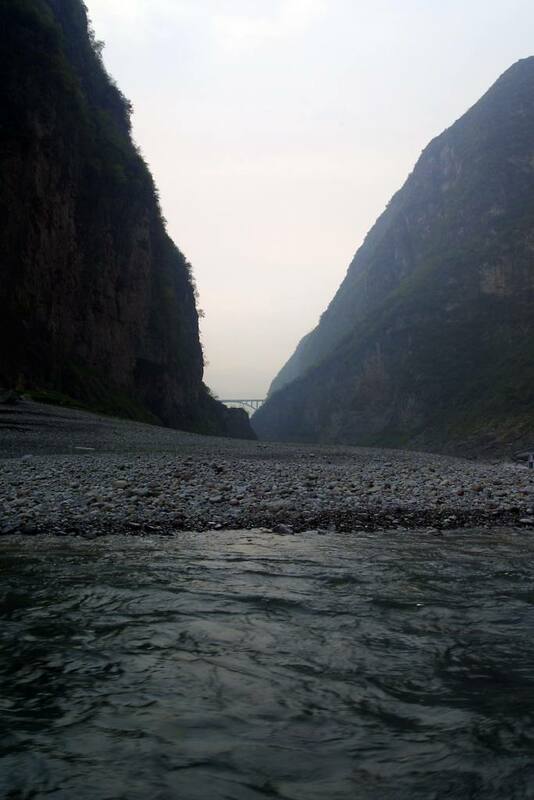 We got to see 2 of the lesser 3 gorges, water was very low on our trip. 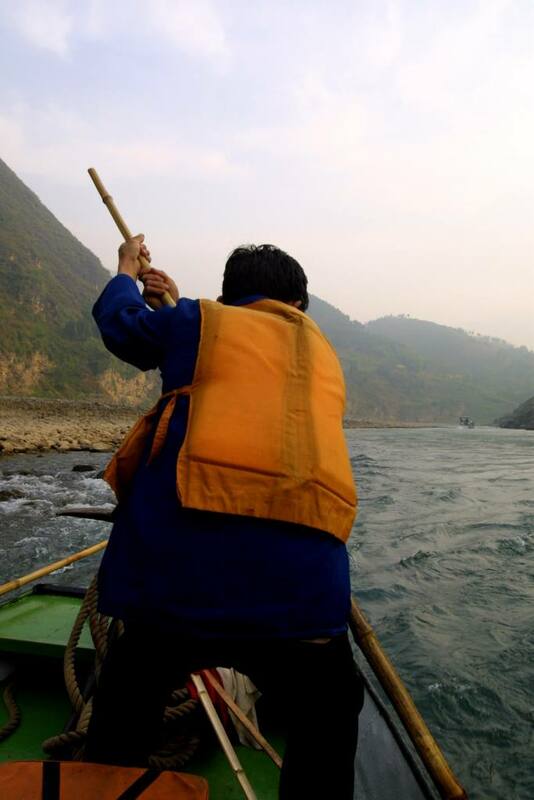 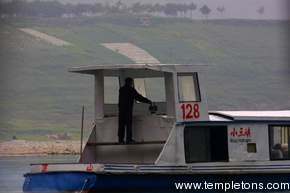 We had to go overland to get a large motorized Sampan to navigate the river. 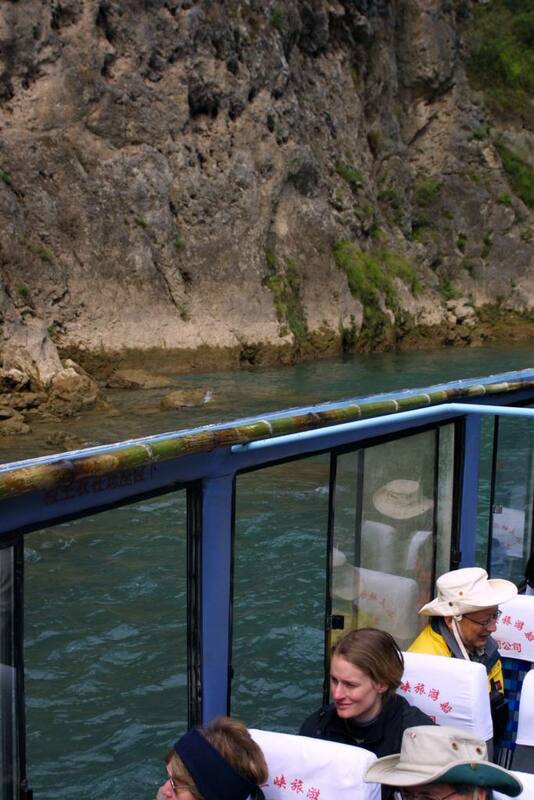 Lots of other tourists were doing the same. 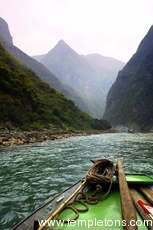 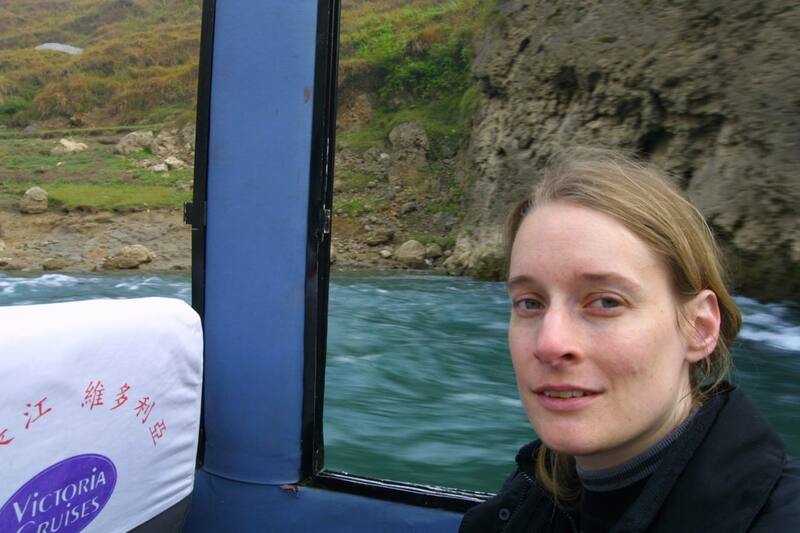 This was one of the more spectacular trips, with rushing blue water, terraced landscapes to be destroyed, monkeys, hanging coffins and men with poles pushing you through the rapids. 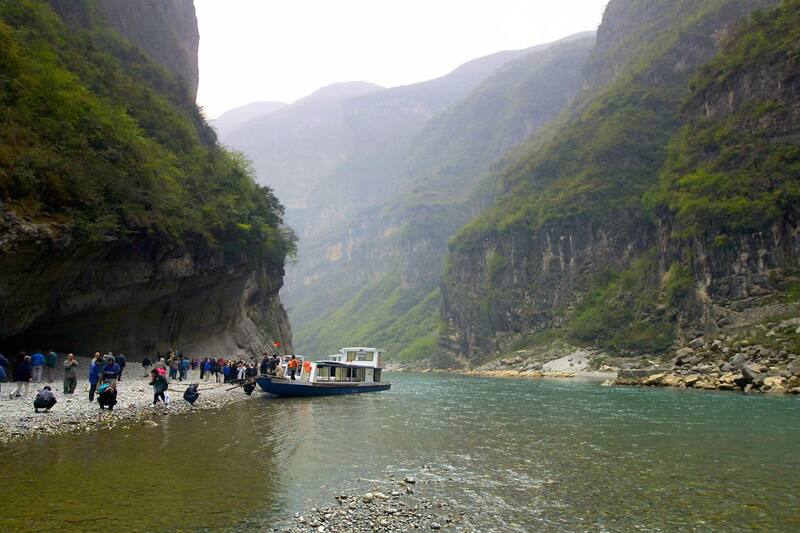 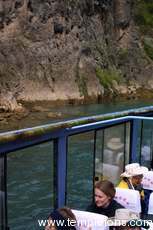 Tourists skip stones where the water gets too shallow. 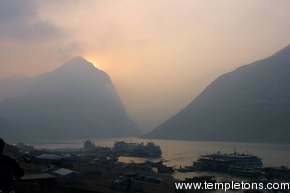 We leave our ship at sunrise. 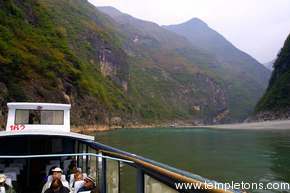 Other ships are docked many deep, as were we. 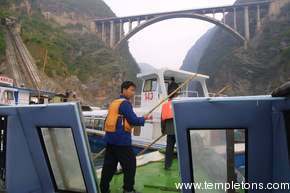 This bridge, at the entrance to the lesser 3, will be 5 feet above water, and thus must be destroyed. 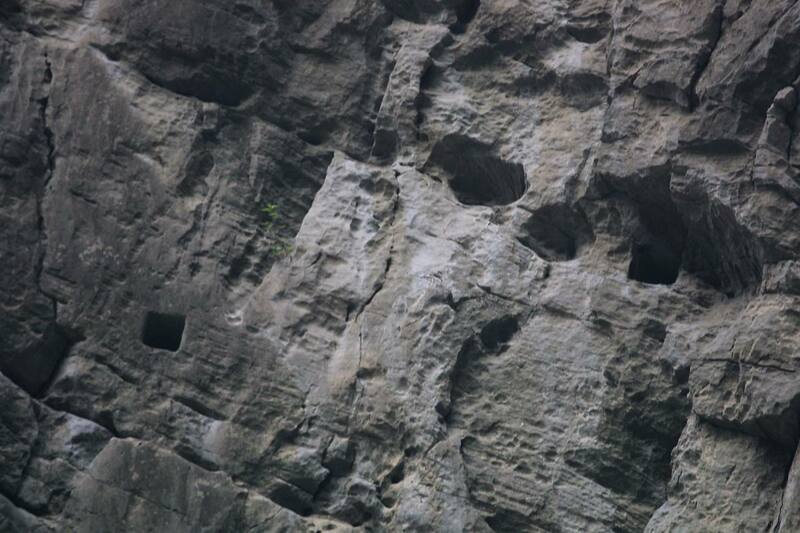 These square holes in the rock were placed there 2000 years ago, so that posts could be put in them to support a walkway for use when the water was too fast. 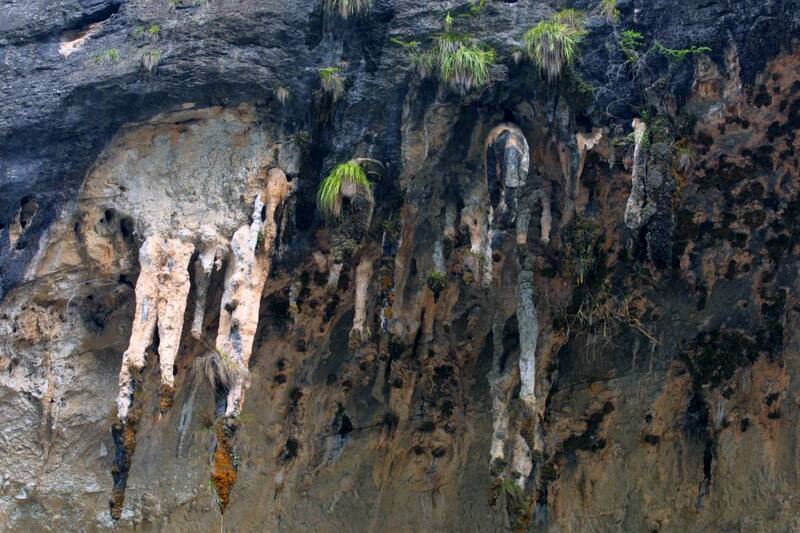 This will be flooded. 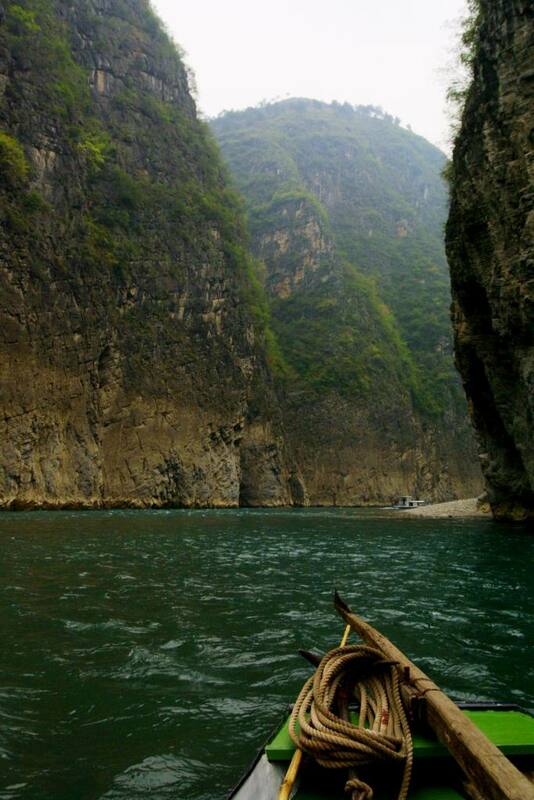 Soon the water will be hundreds of feet deep, no punting needed. 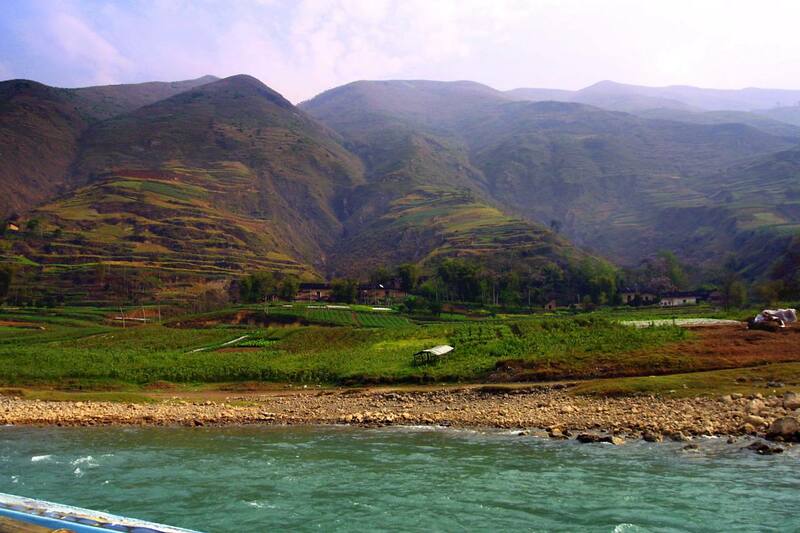 More farmland to be destroyed and filled. 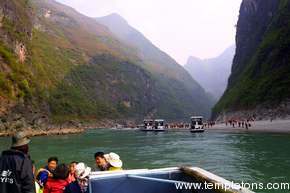 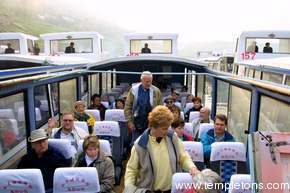 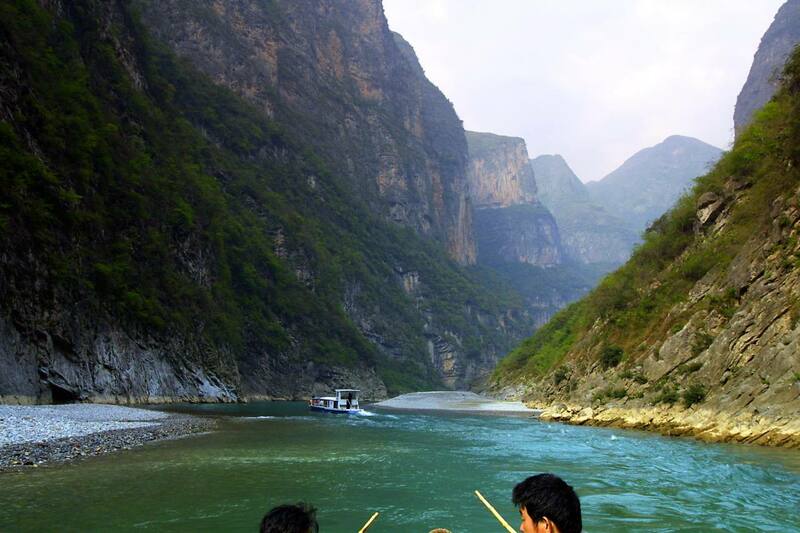 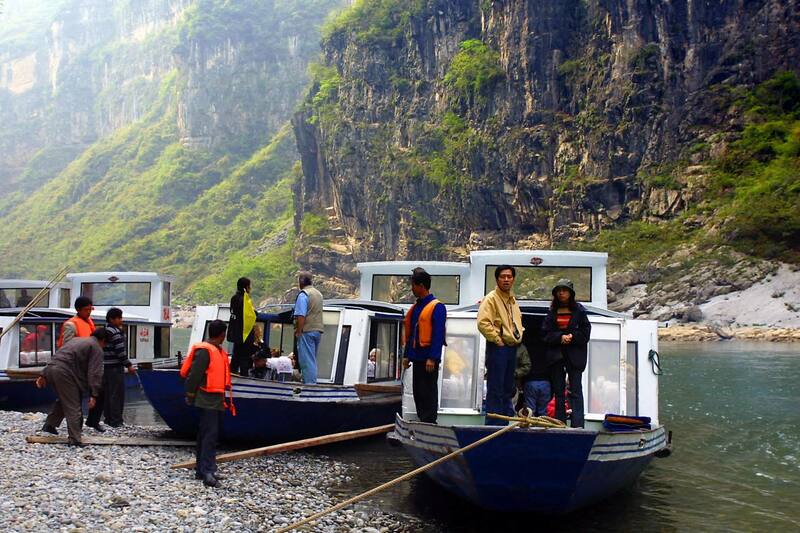 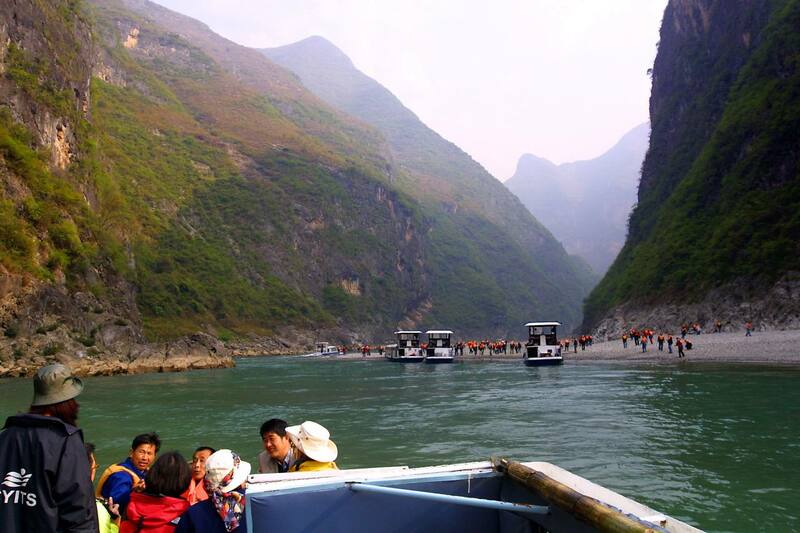 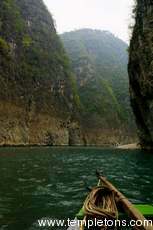 Sampan traffic moves into the 2nd gorge. 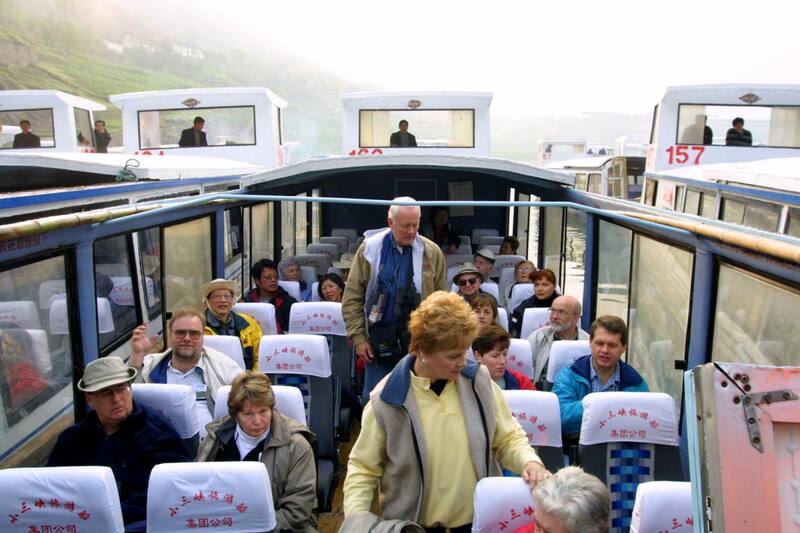 Punters relax and let the motor do the work. 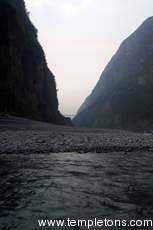 The walls are close and the pollution high. Tourist watches the walls go by. 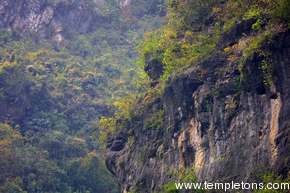 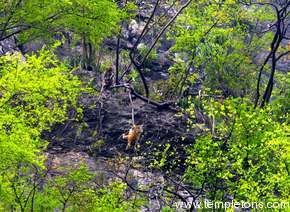 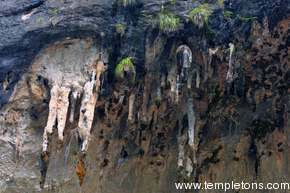 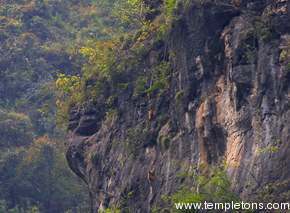 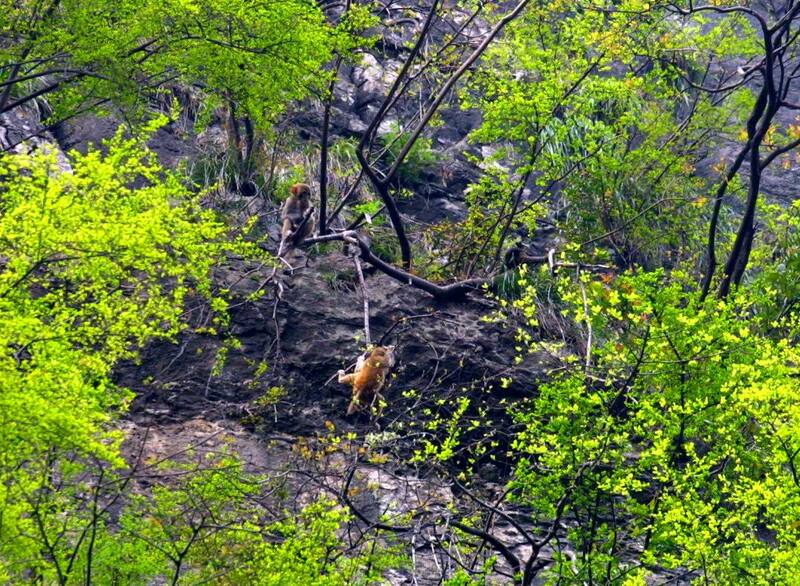 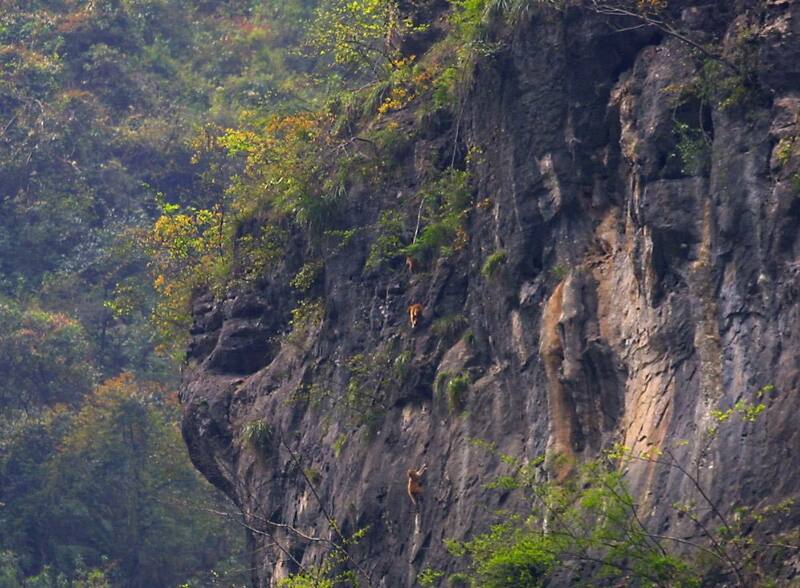 Monkeys play on the walls of the gorge. 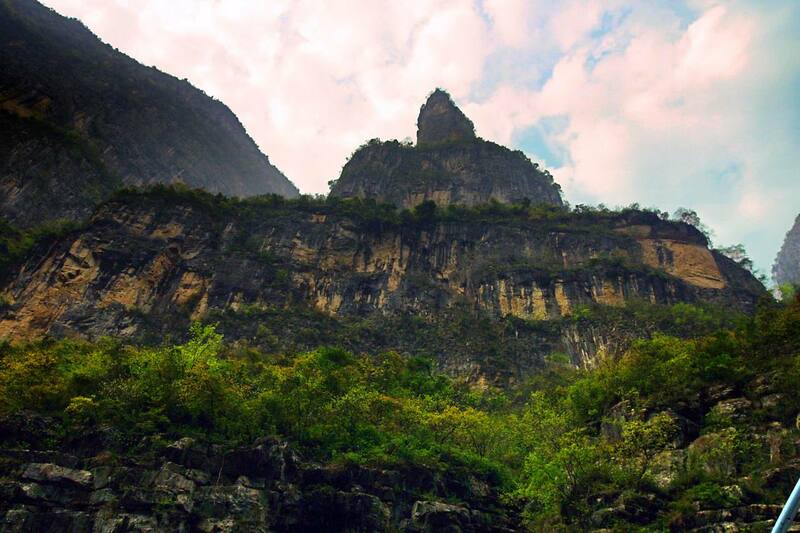 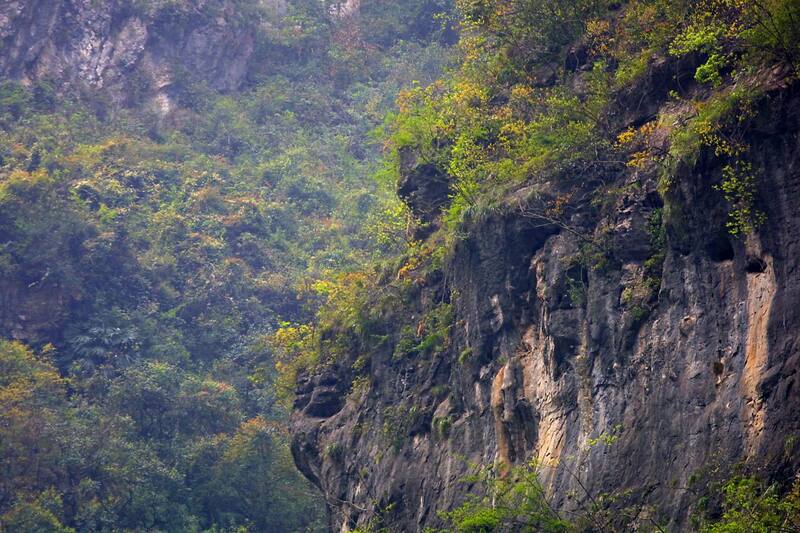 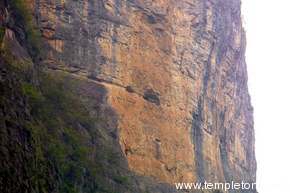 One of the famous hanging coffins, suspended thousands of feet up the gorge walls. 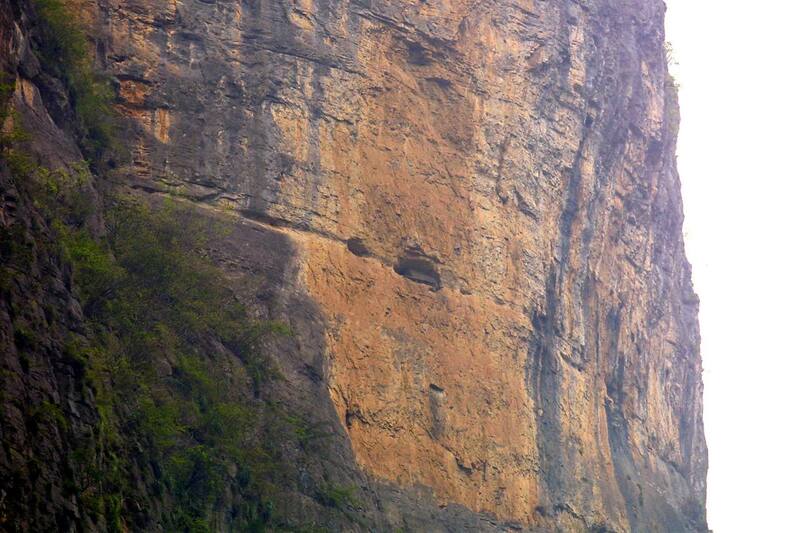 You needed to be powerful to rate this. 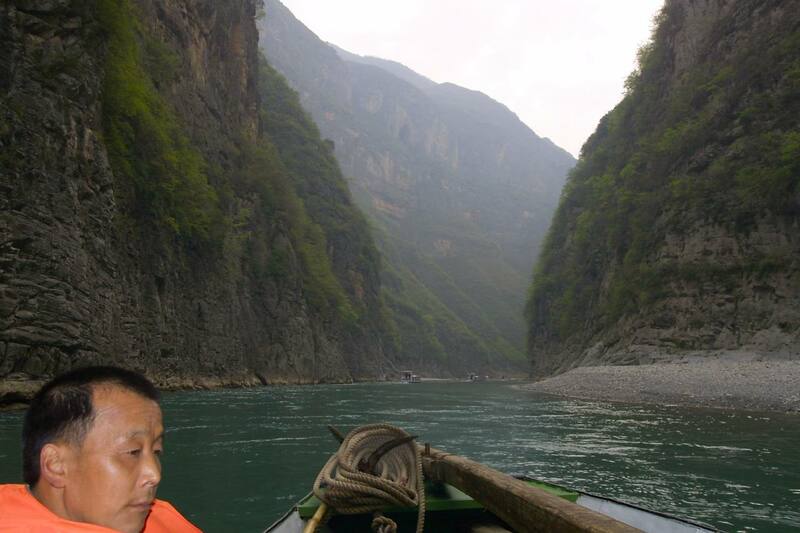 Our tour guide waits on our Sampan. 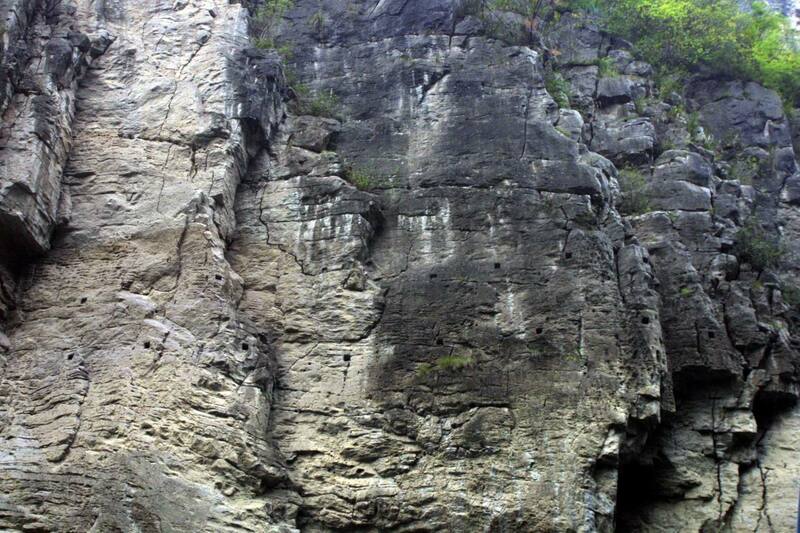 He's seen it before. Punter looks serene as we go downstream. 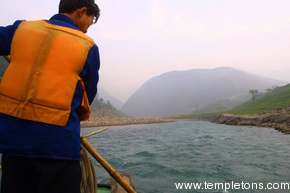 Punter is sublime as we prepare to end the journey.